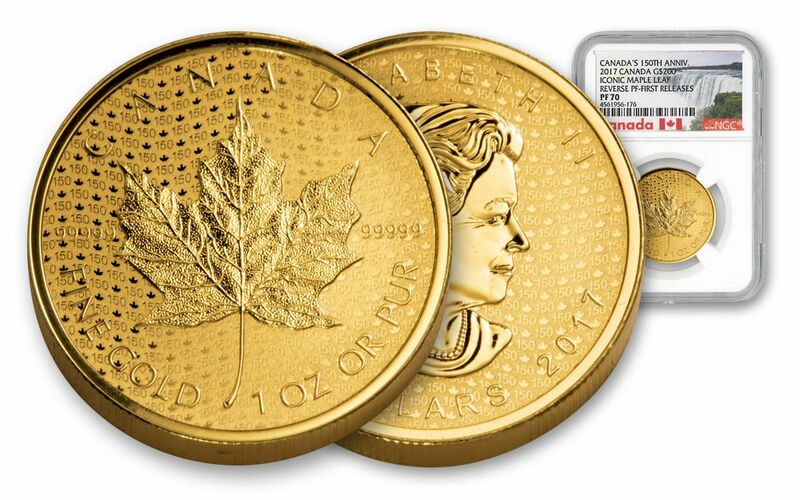 The FIRST EVER Reverse Proof Gold Maple Leaf -- Struck in 99.999% Pure Gold! Here at GovMint.com, we had a feeling that the Royal Canadian Mint was going to pull out all the stops to celebrate the country's 150th anniversary in 2017. And, judging by the stellar output from our friends north of the border, we were right! But, it turns out those fantastic coins and proofs were just the beginning. In fact, this latest blockbuster release from the Royal Canadian Mint is the very first of its kind -- a One Ounce Gold Maple Leaf Reverse Proof! If that wasn't enough, this phenomenal Maple Leaf is minted in 99.999% pure gold! FIVE PHENOMENAL NINES! -- When we talk about precious metal purity, the percentages usually tip out at 99.9% or 99.99%. 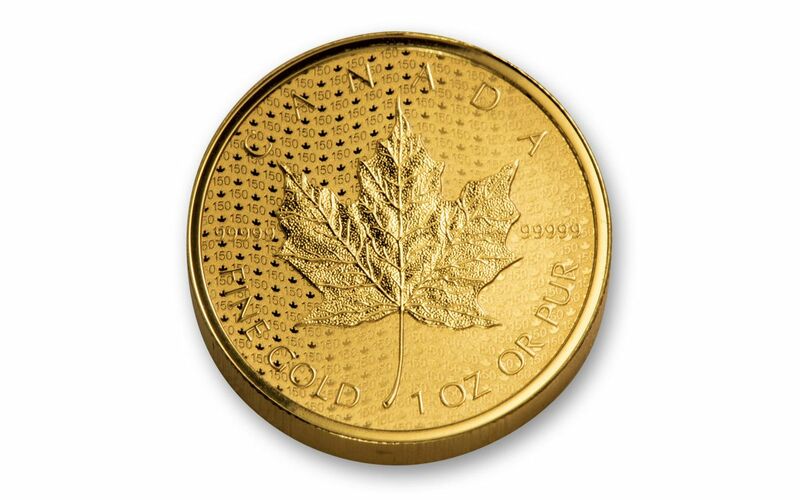 But these Maple Leafs are each struck in 99.999% pure gold -- the highest recognized level of purity for an engraved coin! Any purity higher than five nines would result in gold too soft to strike. The Royal Canadian Mint was the very first mint in the world to strike coins in 99.99% pure gold (1982) and achieve a purity of 99.999% pure gold (1998). So, naturally, a reverse proof like this is definitely in their wheelhouse! A FAMILIAR DESIGN WITH AN ANNIVERSARY TWIST -- This gorgeous Gold Maple Leaf displays the same primary design that has endured since 1979. The titular leaf, symbol of Canadian heritage, unity and pride, is featured front and center with intricate detail. But, look closely and you'll see this leaf is joined by countless others in the background. Using micro-engraving technology, a pattern of patriotic maple leaf waves fills the background, alternating with Canada's anniversary number of 150. This light-refracting pattern doesn't just look beautiful -- it's also a clever forgery-foiling security feature! A PREMIER REVERSE PROOF-- For the first time ever, each of these Gold Maple Leafs has a reverse-proof finish. Like proof-struck coins, these are still the products of hand-selected planchets struck multiple times with polished dies. However, these reverse proofs have lustrous mirror-like features and frosted fields -- a stunning switch! 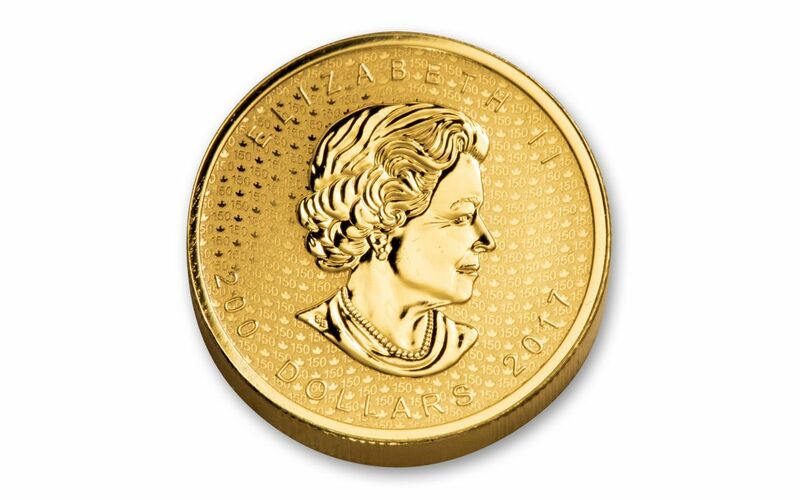 CANADIAN LEGAL TENDER -- Each 2017 1-oz Gold 150th Anniversary Maple Leaf Reverse Proof is 200 dollars Canadian legal tender, a fact reflected on the obverse along with Susanna Blunt's most recent profile of Her Majesty Queen Elizabeth II. 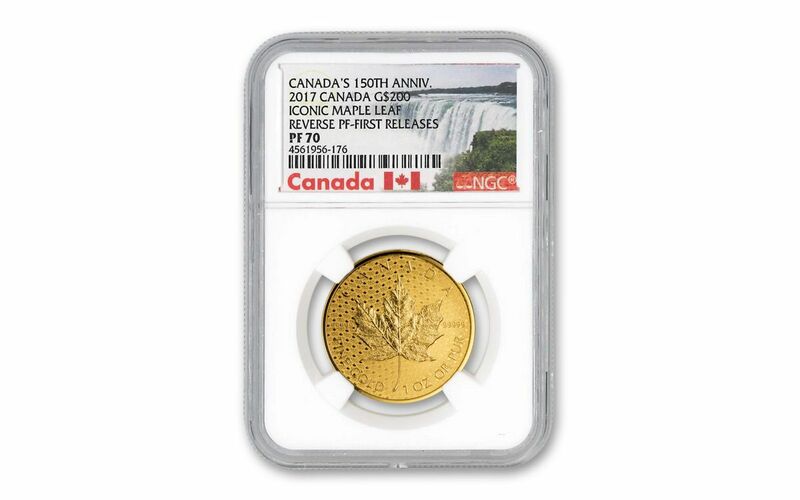 CERTIFIED FLAWLESS -- Your reverse proof will come certified Proof-70 (PF70) by Numismatic Guaranty Corporation (NGC), a distinction that means your perfectly-graded 2017 Gold 150th Anniversary Maple Leaf Reverse Proof will have ZERO imperfections -- showing all features and fields exactly as the engraver and mint intended! In addition, your reverse proof will be certified First Releases (FR) by NGC, meaning that it was among the first struck by the mint and was verified within the first 30 days of issue. Your reverse proof will also be sonically sealed in an acrylic case with a special Canada label, giving you the best in protection while granting clear sightlines into every beautiful detail. Finally, your reverse proof will arrive to you inside a wood presentation box along with its original Royal Canadian Mint packaging and a numbered mint certificate of authenticity. SOLD OUT ON THE MINT WEBSITE! -- Only 500 of these spectacular reverse proofs will be minted. The allotment set for the Royal Canadian Mint's website is completely sold out, leaving only a handful for in-store locations. Fortunately, you don't have to start your road trip to Ottawa, Vancouver or Winnipeg -- you can get yours right now! GovMint.com is the EXCLUSIVE U.S. distributor for these phenomenal Gold Maple Leaf Reverse Proofs. Their companions, the 2017 1-oz Gold 150th Anniversary Maple Leaf Proofs, sold out of their 500-piece mintage rapidly on the Royal Canadian Mint website -- and that's without the reverse-proof finish! Now that it's in your sight, don't miss out -- order your own 2017 1-oz Gold 150th Anniversary Reverse Maple Leaf Proof today!